Domain of unknown function present in yeast peroxisomal proteins, dysferlin, myoferlin and hypothetical proteins. Due to an insertion of a dysferlin domain within a second dysferlin domain we have chosen to predict these domains in two parts: the N-terminal region and the C-terminal region. There are 4654 DysFC domains in 2467 proteins in SMART's nrdb database. Taxonomic distribution of proteins containing DysFC domain. This tree includes only several representative species. The complete taxonomic breakdown of all proteins with DysFC domain is also avaliable. Click on the protein counts, or double click on taxonomic names to display all proteins containing DysFC domain in the selected taxonomic class. 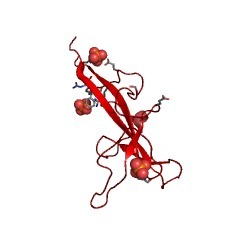 The third human FER-1-like protein is highly similar to dysferlin. Dysferlin, the protein product of the gene mutated in patients with anautosomal recessive limb-girdle muscular dystrophy type 2B (LGMD2B) and adistal muscular dystrophy, Miyoshi myopathy, is homologous to aCaenorhabditis elegans spermatogenesis factor, FER-1. Analysis of fer-1mutants and of sequence predictions of the FER-1 and dysferlin ORFs haspredicted a role in membrane fusion. 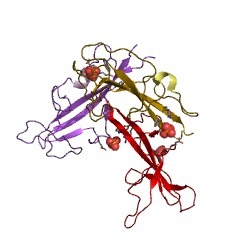 Otoferlin, another human FER-1-likeprotein (ferlin), has recently been shown to be responsible for autosomalrecessive nonsyndromic deafness (DFNB9). In this report we describe thethird human ferlin gene, FER1L3, which maps to chromosome 10q23.3.Expression analysis of the orthologous mouse gene shows ubiquitousexpression but predominant expression in the eye, esophagus, and salivarygland. All the ferlins are characterized by sequences corresponding tomultiple C2 domains that share the highest level of homology with the C2Adomain of rat synaptotagmin III. They are predicted to be Type IItransmembrane proteins, with the majority of the protein facing thecytoplasm anchored by the C-terminal transmembrane domain. Sequence andpredicted structural comparisons have highlighted the high degree ofsimilarity of dysferlin and FER1L3, which have sequences corresponding tosix C2 domains and which share more than 60% amino acid sequence identity. 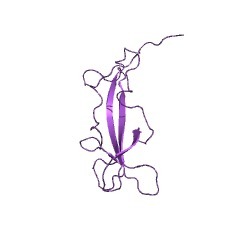 Dysferlin is a plasma membrane protein and is expressed early in humandevelopment. Recently, a single gene, DYSF, has been identified which is mutated inpatients with limb-girdle muscular dystrophy type 2B (LGMD2B) and withMiyoshi myopathy (MM). This is of interest because these diseases havebeen considered as two distinct clinical conditions since different musclegroups are the initial targets. Dysferlin, the protein product of thegene, is a novel molecule without homology to any known mammalian protein.We have now raised a monoclonal antibody to dysferlin and report on theexpression of this new protein: immunolabelling with the antibody(designated NCL-hamlet) demonstrated a polypeptide of approximately 230kDa on western blots of skeletal muscle, with localization to the musclefibre membrane by microscopy at both the light and electron microscopiclevel. A specific loss of dysferlin labelling was observed in patientswith mutations in the LGMD2B/MM gene. Furthermore, patients with twodifferent frameshifting mutations demonstrated very low levels ofimmunoreactive protein in a manner reminiscent of the dystrophin expressedin many Duchenne patients. Analysis of human fetal tissue showed thatdysferlin was expressed at the earliest stages of development examined, atCarnegie stage 15 or 16 (embryonic age 5-6 weeks). Dysferlin is present,therefore, at a time when the limbs start to show regionaldifferentiation. Lack of dysferlin at this critical time may contribute tothe pattern of muscle involvement that develops later, with the onset of amuscular dystrophy primarily affecting proximal or distal muscles. Dysferlin deletion in SJL mice (SJL-Dysf) defines a natural model for limbgirdle muscular dystrophy 2B. A gene related to Caenorhabditis elegans spermatogenesis factor fer-1 ismutated in limb-girdle muscular dystrophy type 2B. The limb-girdle muscular dystrophies are a genetically heterogeneous groupof inherited progressive muscle disorders that affect mainly the proximalmusculature, with evidence for at least three autosomal dominant and eightautosomal recessive loci. The latter mostly involve mutations in genesencoding components of the dystrophin-associated complex; another form iscaused by mutations in the gene for the muscle-specific protease calpain3. Using a positional cloning approach, we have identified the gene for aform of limb-girdle muscular dystrophy that we previously mapped tochromosome 2p13 (LGMD2B). This gene shows no homology to any knownmammalian gene, but its predicted product is related to the C. elegansspermatogenesis factor fer-1. We have identified two homozygous frameshiftmutations in this gene, resulting in muscular dystrophy of either proximalor distal onset in nine families. The proposed name 'dysferlin' combinesthe role of the gene in producing muscular dystrophy with its C. eleganshomology. Dysferlin, a novel skeletal muscle gene, is mutated in Miyoshi myopathyand limb girdle muscular dystrophy. Miyoshi myopathy (MM) is an adult onset, recessive inherited distalmuscular dystrophy that we have mapped to human chromosome 2p13. Werecently constructed a 3-Mb P1-derived artificial chromosome (PAC) contigspanning the MM candidate region. This clarified the order of geneticmarkers across the MM locus, provided five new polymorphic markers withinit and narrowed the locus to approximately 2 Mb. Five skeletal muscleexpressed sequence tags (ESTs) map in this region. We report that one ofthese is located in a novel, full-length 6.9-kb muscle cDNA, and wedesignate the corresponding protein 'dysferlin'. We describe ninemutations in the dysferlin gene in nine families; five are predicted toprevent dysferlin expression. Identical mutations in the dysferlin genecan produce more than one myopathy phenotype (MM, limb girdle dystrophy,distal myopathy with anterior tibial onset).